Never use a christmas card for giving a position statement, nor your target group nor the language will keep it in confidence. SolarWorld tries to backpaddle. Only a few recipients in Europe recieved this very special christmas card, so explained SolarWorld in its excuse. The prompt reaction occured in the US out of the CASM environment. 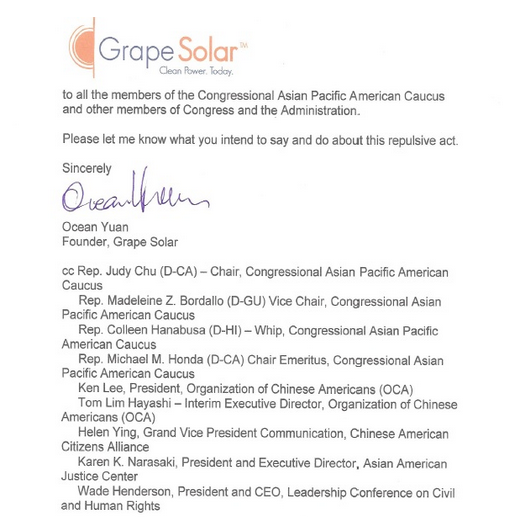 The founder of Grape Solar, an Oregon-based system installer and distributor, Ocean Yuan, asked in the name of the American-Asian community the two Oregon’s senator fellows to disassociate themselves from SolarWorld’s outrageous and racist tactics. SolarWorld and its consortium might have a valid trade claim with the Department of Commerce and International Trade Association, alleging the dumping of Chinese photovoltaic panels into the U.S. market and unfair subsidies by the Chinese state. The U.S. government agencies will soon make their ruling. In the meantime, demonstrating the marketing aplomb that brought us Larry Hagman as a SolarWorld spokesman, the firm dusted off its copies of Sax Rohmer’s Fu Manchu to create the classic holiday message seen below. 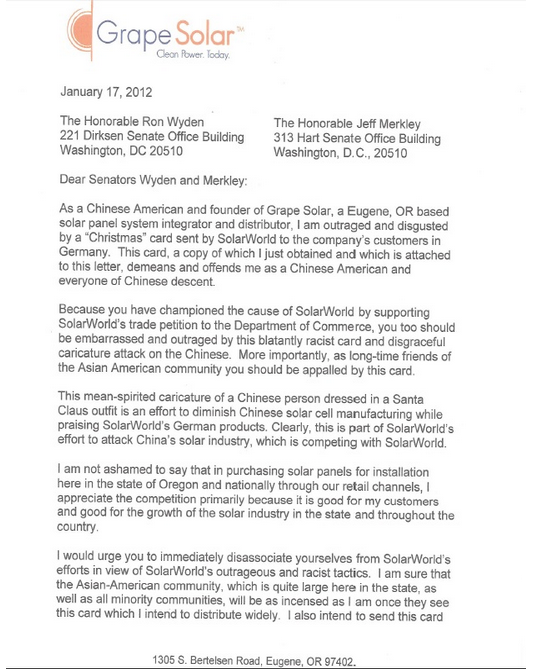 This apology might not placate Ocean Yuan, the founder of Grape Solar, an Oregon-based system installer and distributor. His letter to Oregon’s senators follows. Both senators have been supporters of the SolarWorld case. The Department of Commerce and International Trade Association will make their determinations based on the facts and merits of the CASE case. But if those agencies can take other factors into consideration, then SolarWorld has not done itself any favors with this Christmas card. Log in | 76 queries. 1.207 seconds.